The first Old Settlers' Reunions in Noble County were held at White Rock by the Old Settlers' Society. The Noble County Sentinel of September 17, 1896 describes the third Anniversary celebration. 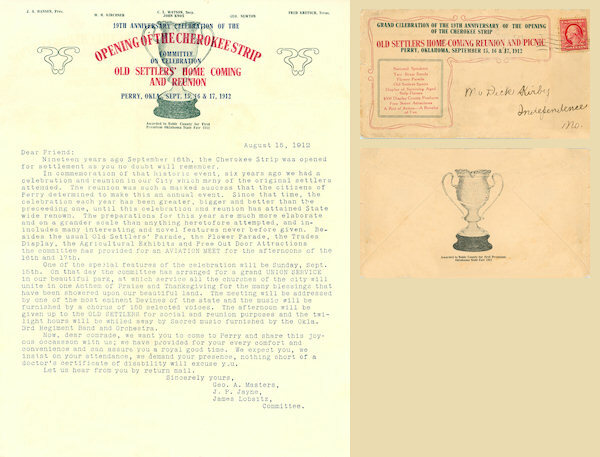 "Yesterday, the 16th, was the third anniversary of the opening of the Cherokee Strip, and a grand celebration was held at Arnold's Grove, one mile south of Whiterock, by the Old Settlers' Society. At eleven o'clock the procession formed at Whiterock and marched to the grove, headed by the brass band from Alert. The procession consisted of about fifty wagons, some being a fac-simile of the ones used on that memorable day - September 16, 1893 - and presented a unique appearance." "After the grove was reached we found a platform, plenty of seats, two barrels of ice water, one refreshment stand and plenty of shade, taking in all, a place just suited for an occasion of this kind." After opening remarks, music by Prof. Hoge's class and an address by Judge Museller, they had a "gorgeous, sumptuous feast." Addresses continued in the afternoon until four o'clock when all attention turned to the race track to witness four running races. The evening concluded with a grand ball at Whiterock. The event was well attended by one thousand people, some twenty-five or thirty from Perry. It is not known how many years Old Settler's reunions were held at WhiteRock, but the 10th Anniversary Celebration in 1903 marked the first Old Settler's reunion we find in Perry history. The reunion of 1906 was such a marked success that the citizen of Perry determined to make it an annual event. The reunion that is best recorded in Perry history was in 1912. A committee was formed to plan the event and invitations were sent to Old Settlers' near and far. The invitation concluded with, "We expect you, we insist on your attendance, we demand your presence, nor thing short of a doctor's certificate of disability will excuse you." Click the image above to see a pdf* copy of the invitation. 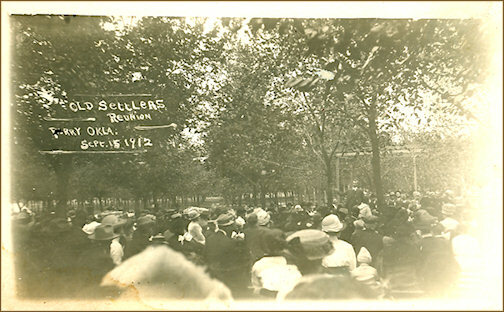 The postcard below captures a glimpse of what it must have been like to be in attendance at the Old Settler's Home Coming and Reunion of 1912. The Old Settlers' reunions continued as part of the Cherokee Strip celebrations for many years. * Denotes a document in Adobe's Portable Document Format (PDF). Adobe Reader must be installed on your PC to access PDF documents. Click the icon on the right to download the FREE Reader now.